Hold your Windows key ( the Windows key is the one located between your Ctrl and Alt keys on your keyboard and has the Windows logo on it). Windows Key + Left Arrow – Snaps the current window towards the left side of the screen. Windows Key + Right Arrow – Snaps the current window towards the right side of the screen. 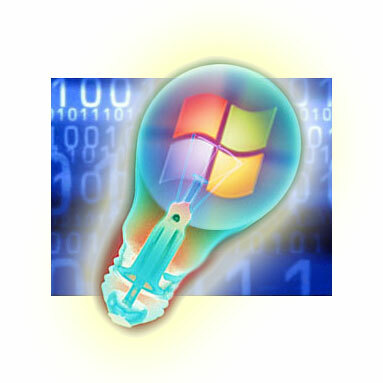 Windows Key + Down – Minimises the current Window. Once the window is minimized, you need to click on it again if you want to access it. Do you like to have complete control over how your Start menu looks in Windows 7 and find there are programs on it that you prefer not see? All you need to do is click your Start button, then right-click the Start menu program you no longer want displayed and then select Remove from this list from the pop out choices. While this is an oldie but a goodie, not everyone is aware of the delights of using they keys Alt & Tab. Say you have many different programs running on your PC at the same time. You might have email (plus a number of open messages) running, a Web browser window open (even two different types at once, say Internet Explorer as well as Firefox), a Word document or two and perhaps ITunes playing your favorite song for good measure. Click on the program’s taskbar icon once, hold that click and slowly drag up. And there’s your jumplist for that program. 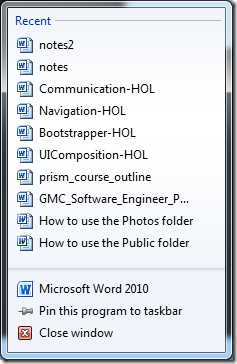 For example if was the Word program icon you did the click and slow drag upwards on, you would see recent Word documents. Simply click on the file you wish to open and the job is done! 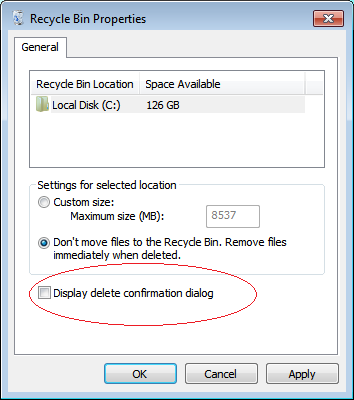 At the bottom of the window, un-check Display delete confirmation dialog. Close the window and that is the end of the message. Of course if you want it back again, repeat these steps, checking instead of unchecking. I was writing notes last week on using Presenter View in PowerPoint (so that the presenter can view his or her speaker’s notes, while the audience sees the actual presentation). In order to test my notes I needed to install a second monitor. Can’t believe how easy Microsoft have made it-basically plug and play if you are using Windows 7, Vista or XP. However if you would like a nicely written article to guide you through, this one from Microsoft themselves will do the trick: http://www.microsoft.com/athome/organization/twomonitors.aspx. With two monitors up, you can easily drag windows/applications from one to another; so for example you can be working in Excel on one monitor and easily mouse click across to the other Window which might have Twitter, Facebook, Word or anything else you desire, open and ready to go. Have to say I’m loving it and will keep them both. 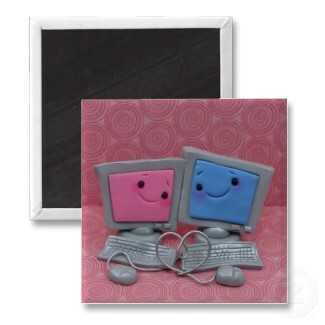 Maybe you are having a house-guest, or maybe you want to grant one of your children access to your computer, but don’t want anything happening to your files. The solution is to enable your Windows 7 Guest Account. In the Search Box type “Guest Account” and press Enter. This will put you in the Manage Accounts window. Click the Guest user icon. The guest account is now enabled. If you want to turn it back off, just repeat these steps!